Virtual life is an expansion of ourselves in this Digital Era, of our way of thinking, communicating, interacting… to life our unique identities in multiple ways. To imagine. E.V.E*, more than offer you a fashion product for your Second Life, wants to help you to expand your imagination and preserve your originality. Be unique, break your barriers! *E.V.E is artist Noke Yuitza’s brand for CG art and fashion designs in Second Life. The brand objective is to expand users imagination and preserve their originality through applying science and art techniques, as how light performs over sand particles or clothes behavior under zero gravitation, to create pieces that are original from their concept design to the final product, innovating and being avant-garde in the way they perform in virtual worlds. Performing artist, stage/set designer and communicator that uses Second Life since 2009 for CG Art installations and fashion design. Noke has created scenes for many RL/SL projects and virtual spaces as LEA (Linden Endowment for the Arts), the Brera Academy of Fine Arts (Milan, Italy), the UWA (University of Western Australia) or Mosi Mosi Agency (Barcelona, Spain). With E.V.E, participates in events and fairs as Second Life Shopping Events (Linden Labs), We ❤ RP, Enchantment, and FGC among others. Rapunzel’s Towers (RL-VR project. Soon more information). 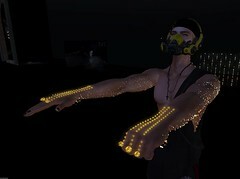 Last installations: Transcendence After Poison Rain (University of Western Australia) and Poison Rain (in Craft Virtual World), Dystopia Chapter 2 (LEA). Previous big installations: Dream, for Arte Libera, and The Sea of Cubic Dreams, an Art Game installation with Alegria Studio (previous brand) for LEA and Love is a Battlefield (in Craft Virtual World).